WICKED announces 10th Anniversary cast! WICKED, the West End musical phenomenon that tells the incredible untold story of the Witches of Oz, is proud to announce that, from Monday 5 September 2016, the new cast that will lead the award-winning show through its 10th birthday celebrations at the Apollo Victoria Theatre will include: Rachel Tucker, who will return to the London production direct from a triumphant run on Broadway to play Elphaba; Suzie Mathers, who joins from the Australian production to star as Glinda; Oliver Savile, who continues as Fiyero; Anita Dobson, who joins to play Madame Morrible; Mark Curry, who continues as The Wizard; original cast member Martin Ball, who returns to play Doctor Dillamond; original cast member Katie Rowley Jones, who continues as Nessarose and Idriss Kargbo, who joins to play Boq. Alice Fearn will be Standby for Elphaba and Carina Gillespie continues as Standby for Glinda. The production, acclaimed as “pure magic” (Time Out London), is currently booking until Saturday 29 April 2017. Please note that Rachel Tucker, Anita Dobson and Katie Rowley Jones appear until Saturday 28 January 2017 only. Current London cast members Emma Hatton (Elphaba), Savannah Stevenson (Glinda), Liza Sadovy (Madame Morrible), Sean Kearns (Doctor Dillamond), Daniel Hope (Boq) and Natalie Andreou (Standby for Elphaba) will all play their final performances on Saturday 3 September 2016. On Tuesday 27 September 2016, Wicked will celebrate an extraordinary 10 years in London. Now the 8th longest-running show in the West End* and already the 19th longest-running show in West End theatre history*, the “hugely popular show” (The Times) has played over 4000 performances and been seen by over 7 million people in London alone. A limited number of tickets for the 10th Birthday performance will go on public sale on Friday 27 May 2016 at 12.00 noon via the Wicked UK website only. Priority Booking will be available to subscribers of the Wicked Ozmopolitan e-newsletter from 10.00am on 27 May 2016. Please note that there will be no Day Seats released for this performance. Please visit www.WickedTheMusical.co.uk/Wicked10 for more information and to sign up. 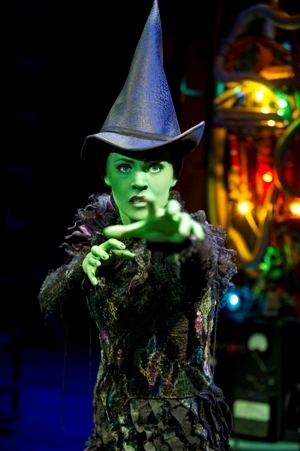 From Monday 5 September 2016, Wicked will star Rachel Tucker (Elphaba), Suzie Mathers (Glinda), Oliver Savile (Fiyero), Anita Dobson (Madame Morrible), Mark Curry (The Wizard), Martin Ball (Doctor Dillamond), Katie Rowley Jones (Nessarose), Idriss Kargbo (Boq), Alice Fearn (Standby for Elphaba), Carina Gillespie (Standby for Glinda), James Darch, Kerry Enright, Freya Field, Joseph Fletcher, Fraser Fraser, David Gale, Sergio Giacomelli, Alexandra Grierson,Olivia Kate Holding, Aaron Jenkins, Claudia Kariuki, Will Lucas, Chanel Mian, Billy Mitchell, Scott Monello, Ella Nonini, Rosa O’Reilly, Julienne Schembri, Joe Sleight, Jessamy Stoddart, Paulo Teixeira, Joe Toland, Hannah Toy, Russell Walker, Sasha Wareham and Helen Woolf. Wicked has music and lyrics by multi Grammy and Academy Award-winner Stephen Schwartz (Godspell; Disney’s Pocahontas and The Hunchback of Notre Dame) and is based on the novel ‘Wicked: The Life and Times of the Wicked Witch of the West’ by Gregory Maguire and adapted for the stage by Winnie Holzman. Musical staging is by Tony Award-winner Wayne Cilento and the production is directed by two-time Tony Award-winner Joe Mantello.